StateReporting.com is the official Continuing Education Management Service contracted by the South Dakota plumbing commission. Plumbing Contractors, Restricted Plumbing Contractors, Plumbers or Restricted Plumber licenses must obtain 4 hours of continuing education every year before license renewal. Courses must be related to the plumbing trade, such as plumbing installation, design, state codes (such as the UPC), products, innovations or new techniques. This 4 hour class on significant changes to the 2012 Uniform Plumbing Code for South Dakota covers every significant change in the 17 chapters of the 2012 UPC. It skips minor changes but includes every change covered in the published companion to the UPC, "Guide to Significant Changes" with more detail than the book offers as well as covering many changes the book fails to address. It will meet the 4 hours needed by all licensees in the state. 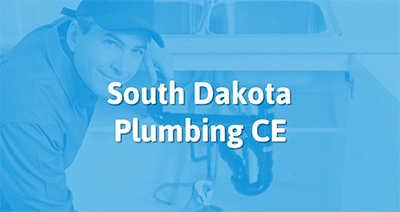 Our South Dakota Plumbing continuing education courses are done At Your Own Pace. Class Title: South Dakota 4 Hour 2015 Plumbing Code Updates Chapters 1 through 5.